Albinos are called Zeroo, Zeroo or “ghost people”. In Tanzania, it is estimated 1 in 1400 births are albino compared to the USA where it is 1 in 20K. The Tanzania Government estimates there are over 300K albinos in Tanzania. The albinos have terrible skin sores and the sunburns there skin terribly. They are also a lot of times born deaf and blind and statistically do not live to be older than 30. Yet, this is not their greatest risk of death. It is humans hunting them. Superstition in Tanzania says that giving birth to an albino is a curse and an embarrassment to the family. If you own a part of an albino’s body, it will make you rich and give you magical powers. So albino body parts are a lucrative business. The witch doctors mutilate the albinos and make potions from their flesh, bones, and hair. This is sold to those that believe in the villages. The Tanzania Government has begun to take a harder stance on prosecuting those that sell these body parts, but they are still not safe. The albino compounds are the only truly safe place for them to live. We visited the facility that was initially set up to house 40 children. This is what the Tanzania government gives food allowance for. Yet there are currently near 400 children, including the deaf and blind. Right now 40 scholarships have been set up for 40 children to attend outside schools, but there are 360 children? Food and necessities are greatly needed to take care All of the children that live there. There are only three paid staff members to take care of the children. The needs are food, underwear, sunglasses, hats, lotions, oils, bed sheets and mattresses. 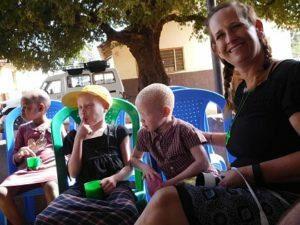 The albino facility was not on our agenda to visit this trip, but we really wanted the new team members to experience the children and feel the need the children are greatly in need of. Compared to the last visit, the children were much more behaved even though there were more children this year. They sat quietly and listened to Bishop Makala. We gave them a weeks’ worth of food, which doesn’t sound like much, but it was 5 large bags of rice and beans. We brought hats, stickers, and some other goodies. We handed out our supplies to the caregivers this time and not to the children. This kept the children from grabbing and snatching from each other. A special moment for me was sitting next to two girls named Jackie and Elizabeth. I did give them each a plastic hot pink cross necklace. As we drove off, I saw them go arm in arm off around the corner and look at each other’s cross. They waved to me and were laughing and giggling together. It was a great moment!